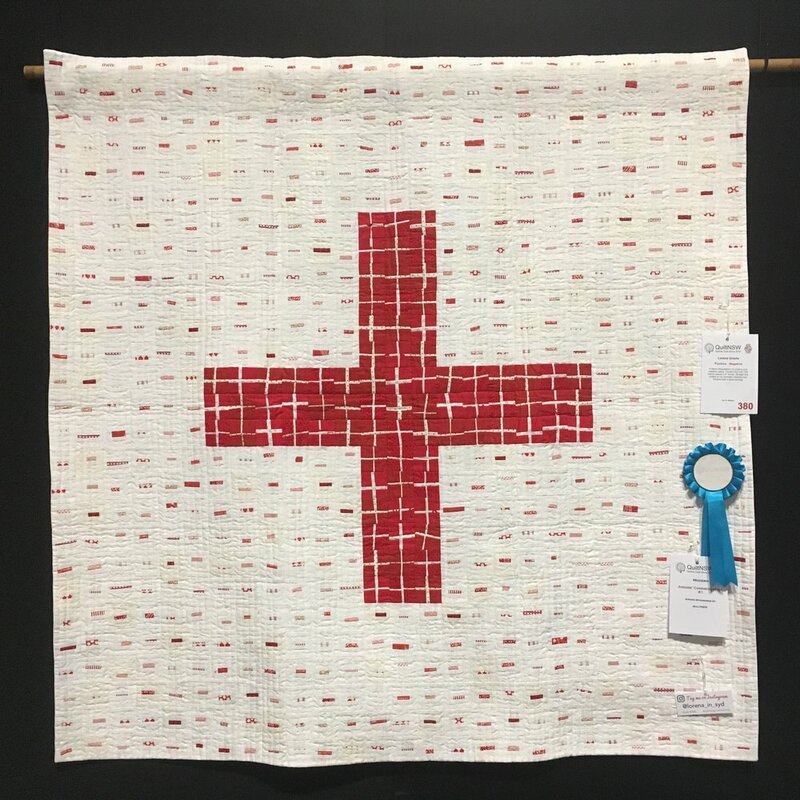 I had an unexpected opportunity to go to the Sydney Quilt Show last weekend. So many stunning quilts to see! The intricate workmanship and time invested in these quilts was mind blowing. Here are just a few that took my eye! It was very exciting to see Thimblestitch Susan and her gorgeous winning entry. Susan says she started with just a few red and cream paper pieced diamonds, but then just couldn’t stop! Hand pieced and quilted, I love the understated elegance of this quilt. In terms of intricacy and workmanship, it doesn’t get much more impressive than ‘Colourful Retina’ by Sugy Kim. An original design, this quilt is pieced by hand and machine. Appliqué and quilting is all by hand. Many of the pieces in this quilt are barely ⅛” wide. I overheard one of Sugy’s fellow stitchers saying that she meticulously auditioned fabrics and shades of quilting threads, working smaller samples before committing them to her quilt. It is a masterpiece! Wouldn’t it be interesting to analyse the personality traits of quilters? I wonder what proportion would be introverts? Prone to perfectionism? Obsessed with accuracy and order? Competitive? Challenge seeking? Hmmm, I wonder! This next quilt is ‘Floral Odyssey’ stitched by Anne Blythman, from a pattern by Yoko Saito. An extraordinary combination of hand appliqué and embroidery, this quilt felt very calm and restrained because of the colour palette. I guess I was also drawn to the blooms! The quilt I returned to more than once was ‘Story Book’ by Susanne Cody. Each of the hexagons represents a story and features precious textiles collected over many years. My photos don’t do justice to the past-worldliness of this beautiful quilt. In a departure from all the ‘prettiness’, but artistically striking, was ‘Obama’ by Nicolas Wilson. The image is cleverly created by bonding hand dyed batik dots to a cream background. If you look closely, you’ll see the American flag in the quilting. ‘The World Awaits’ is Neroli Henderson’s reflection on the social change happening in response to the #MeToo and #TimesUp movements. Neroli has created a very powerful message of the damage caused by sexual assault, and how this damage is often internalised by women because of fear, judgement & social stigma. This internalisation is represented on the quilt by stitching thoughts and emotions directly onto the model’s body. Words of empowerment and hope are quilted into the backgound. Returning to blooms, as I’m wont to do, I love this: ‘Flora Bush Blooms 2’ by Anna Brown. I see grevilleas in this piece. Stunning! I’m noticing a trend in my preferences for 2-colour designs! This is ‘Positive : Negative’ by Lorena Uriarte. It is made from 729 improv pieced 2.5” blocks. And so, for some colour, I love the over-sized double wedding rings of ‘On the Double’ by Lisa Moult. And also the exuberance of ‘Triangle Trails’ by Kathryn Kelton. Well done you if you’re still with me at the end of this post! I think we need a little sit down after all that. A chair for you, a chair for me and the promise that we can learn to sew for five bucks!! That’s optimism in any stitcher’s book!